At age 9 I held a guitar in my hands the first time and tool lessons for about 15 years. Due to job-activities I had to slow down the quantity of play, but still is a good non-techie balance. 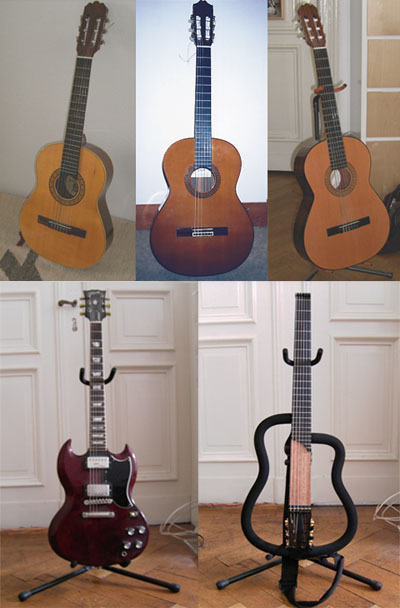 In former times I mostly played classical guitar (Tárrega, Albéniz, Sor, Bach etc.) nowadays I play more jazz (direction of hero Joe Pass) and brasilian (bossa nova, samba, choro etc.) stuff. Currently I and am part of the Brasil Ensemble Berlin and of the band Convoi Exceptionnel (electrical/acoustic/sphere direction). I love lots of other music (Tracy Chapman, Paul Simon, Damien Rice etc.). Often chords aren’t that difficult so discovery of tune is no problem by just listening and trying it out on the guitar directly. Some time ago when I was 18 I did a record mostly with classical stuff, which I do not play that often these days. Anyways just have a try to listen to some tunes I recorded. We play music with acoustic/electronic elements (there are loads of influences, so I won’t name them here). Further more we mix music with video-art. Check out tunes and some live performance videos on our band site on Convoi Exceptionnel.